Thanks for stopping by. Like many people who enter the blogosphere, I’m not entirely sure what I’ll be saying here as time goes by. My current intentions are to use this space to elaborate on some of the techniques I use in the digital darkroom and to reply to some of the comments and questions I’ve received regarding the tutorials on my website. I’d like to start by discussing my all-time favorite Photoshop technique, which would be luminosity painting. This technique is perhaps the most powerful way of using the luminosity masks. Painting leverages the potential of the masks to a much higher degree than simply using them as masks on adjustment layers. Painting allows both multiple brush strokes to intensify the effect of the luminosity mask and precise placement on the image to provide perfect control as to which parts of the image are affected. Create a Burn/Dodge layer in Photoshop—New layer>fill with 50% gray>change blending mode to Soft Light. With a paintbrush, paint through this selection onto the Burn/Dodge layer. Paint white to lighten (dodge) the underlying tones and paint black to darken (burn) them. There are all kinds of variations within this process that increase your control over how the image is affected—the tones that are selected by the luminosity mask; the shape, size, and hardness of the brush; the opacity of the brush stroke; and number of brush strokes are some examples. While there can be many aesthetic reasons for using luminosity painting with an image, my personal goal is usually to use it to bring a certain degree of balance to the overall light and contrast in the scene. This is a very personal decision, and everyone is free to decide and create their own personal balance of tones using this painting technique. Here’s an example how it was used in a recent image. The image below shows the final version of an image after it had been luminosity painted. 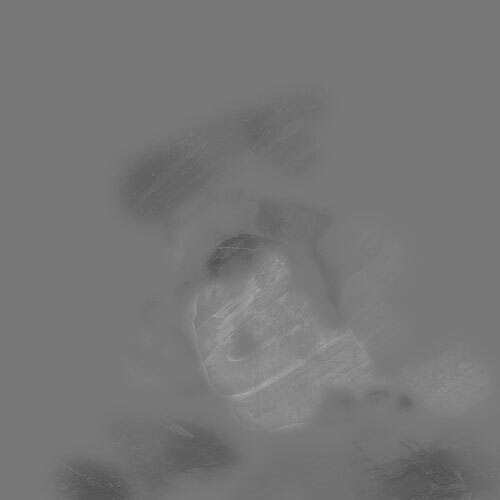 A mouse rollover of the image shows what it looks like with the luminosity painting removed. Hopefully you can see and appreciate how the painting increased the brightness of some areas and darkened others, while at the same time maintaining overall contrast and slightly improving saturation. The next three images show the painted Burn/Dodge layers that were used for luminosity painting. The first shows painting to bring down the highlights in the scene. Black paint was first applied through a selection of the Bright Lights minus the Super Lights. When it was found that some of the brightest tone still were too bright, a new mask, call it the Super-Duper Lights, was created by intersecting the Super Lights mask with itself. Though I’d not tried this mask before, it worked very well here for painting through to bring the lightest tones down to where I felt they looked right. 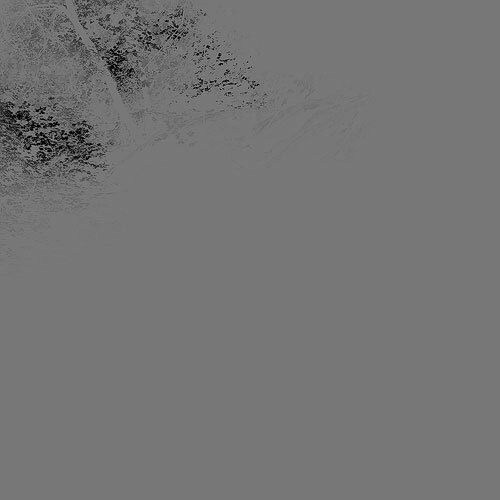 The second Burn/Dodge layer (below) was used to paint both black and white through a Basic Mid-tones selection. Parts of the image were darkened with black paint and other parts were lightened with white paint. Painting through a Basic Mid-tones mask is an easy place to start luminosity painting. The changes occur in the mid-tones and the result is usually improved contrast in the image. While I put no limitations on the masks I’m willing to paint through, it’s surprising how many times painting through the Basic Mid-tones mask is part of the process. The final Burn/Dodge layer for this image (below) was painted on through a Light Lights mask intersected with a Darks mask. Intersecting a Light-series mask with a Dark-series mask can be a bit tricky. You’re basically restricted to the Expanded Lights, Lights, and Light Lights in the Lights-series and the Expanded Darks, Darks, and Dark-Darks in the darks series. In this case I wanted to do two things: darken some of the slightly too light tones at the upper end of the mid-tones at the top of the arch and lighten some of the dark areas of rock on the right side of the image to give more texture and contrast here to better balance the texture and contrast on the leafy left side of the image. This intersected mask just happened to work well to accomplish both goals with the black paint darkening the too-light areas at the top of the arch and white paint lightening and bringing out more texture on the right side of the image. NOTE: Instead of three separate layers, all this painting could have been done on a single Burn/Dodge layer. These painted layers are instructive as they show several important characteristics of luminosity painting. 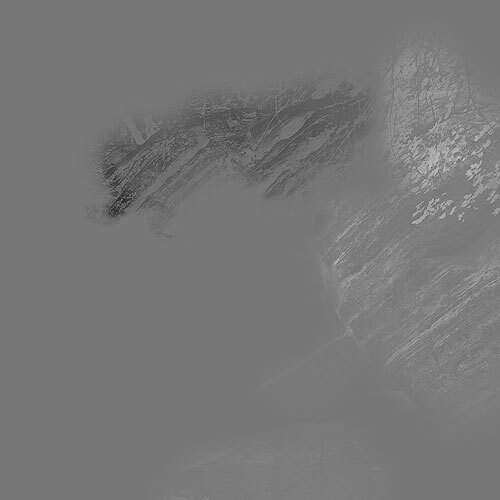 What should be most apparent is that parts of the image appear to be embossed in gray-scale onto the layer. This is the direct result of painting through luminosity selections/masks which select specific tones to receive paint. Areas darker than 50% gray darken the underlying tones in the image and areas lighter than 50% gray lighten the underlying tones. Applying paint through an active luminosity selection both selects the pixels that receive paint and darkens or lightens these pixels as the paint is applied. Because luminosity selections partially select pixels in proportion to their brightness, paint is also applied proportionally as the brush is stroked across the Burn/Dodge layer. The net result is not only that the tones in the desired parts of the image are changed, but the change is also perfectly blended into the surrounding pixels. (The partially selected tones receive the exact amount of paint to make sure each brush stroke merges seamlessly with similar tones.) Brush strokes can be applied repeatedly until the desired change is achieved in the specific parts of the image where the change is desired. By choosing the correct mask or combination of masks to paint through, significant control can be exercised with regard to the final brightness and contrast of the painted areas. The only way to really get a feel for what luminosity painting can do for an image is to try it. A good place to start is to load the Basic Mid-tones as a selection and try darkening and lightening parts of the image by painting black and white respectively onto a Burn/Dodge layer. Start with a brush opacity of 50 to 100 percent since the Basic Mid-tones mask is quite dense and it will sometimes take a lot of paint to make noticeable difference on the image. Once you get a feel for what’s happening when painting through the Basic Mid-tones, try masks from Lights- or Darks-series to see how painting through these can select specific tones for adjustment. Experiment. See what happens, figure out what’s going on, and then make it work for you. Luminosity painting allows you to touch the light in your image and make very precise adjustments to specific tones. The decisions you make in luminosity painting are completely personal. You decide what needs adjustment, and then you make the adjustment to your satisfaction. It’s your hand on the mouse (or pen), it’s your brush strokes on the image, and it’s your idea of how the image should look. To some degree, you are actually inscribing your signature into the image’s pixels as you paint, personalizing your image with a signature look. I hope you’ll give it a try. I’m very happy that you have open a blog, now i’ve the possibilities to follow you and your new tutorials. About this tutorial, i think that after create a mask it’s very useful to type Ctrl+h (cmd+h) to hide the marching ants that define the selection (like you have write in your tutorial “luminosity painting”). Thanks, Antonio. I made an edit to include this. I am so much pleased to see your Blog . Actually speaking everyday when I connect to net I invariably see your site once in a day for any of your writing . From now onwards we will be en reached going through your new writing in your blog . Anxiously waiting for your new writing . do your teknikk work on adobe elemens? The actions that I’ve created to make the various masks only work in Photoshop in versions CS1 forward. I’ve not used Elements, but there may be ways to do similar things using this program, though without actions, it would likely be more laborious to make the masks. I grew up with film and don’t like some of the full blown “over-processed” images that get cranked out via PS, but your actions, and the Luminosity Painting in particular, enable you to take as subtle control as you like over specific tones. I use them most of the time on my landscapes and there’s no question they enhance and “refine” the overall image. Great tutorial Tony. Thanks. Will give it a try this weekend. Hi Tony, awesome to see your blog up and going will make sure I put it on my blogroll and get some traffic from Australia heading your way. Will be following with interest. Thank you so much for sharing this wonderful information. I’ll be sure to let our photographers know about this blog. Your work is distinctive and has helped me to learn new things. I thank you deeply and will buy your whole bag of tricks! Cheers!